If you are growing any crops, rural or urban, please be sure to fill out the the Census of Agriculture. This census counts farms and ranches and those who operate them. Whether small or large plots of land, your response counts if $1,000 or more of fruits, vegetables, and certain livestock were raised and sold during the 2017 Census year. 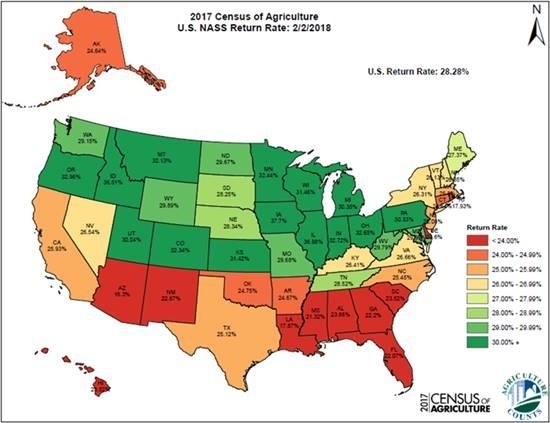 The Census of Agriculture deadline is days away and the survey responses continue to flow in from California. So far, only 25.93 percent of California producers have responded. See the map below for the complete picture of return rates as of February 2, 2018. Did you know it is easier than ever to respond online? NASS introduced an improved online questionnaire and included new questions to document changes and emerging trends in agriculture. Visit https://www.agcounts.usda.gov/cawi and be counted today. For more information, visit www.agcensus.usda.gov or call 1-800-727-9540.